I have tried everything you could ever imagine over the past 5 years. Going to the gym, doing outdoor boot camps, YouTube video workouts. I tried every fad diet, Weight Watchers, Jenny Craig, the Lemon Detox, every smoothie under the sun, interval eating, and even not eating all… the list goes on and on. In the end, none of those things were working. I’d find myself either starving, or wanting to collapse from pushing myself too hard and although I was losing weight, it would all come back on (plus 5 extra kilos) due to the fact that all those steps I was taking were pretty stupid and/or unsustainable for my lifestyle in the long term. I walked into Core Principles in 2017 having not exercised for about a year. 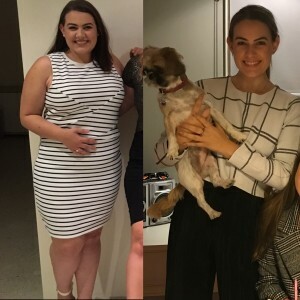 I had lost 17 kgs on my own, but I knew I was going to need to start moving my body again. Not only for weight loss, but now I wanted to change my whole life. I had the need, but mostly I had the want to now become the healthiest version of myself. I suffer from a chronic disorder, Fibromyalgia, which is where you suffer from widespread pain in the muscles and bones, and it also triggers chronic fatigue. I knew in order for me to be the healthiest and happiest version of myself and for me to be able to look after those around me and enjoy my life far into the future, I had to start getting fit. It’s all about consistency with exercise, while also learning to push your limits, and that was something I was struggling to learn on my own. When I came in for the first time, I already wanted to run away and quit, I thought “this is too hard, and I haven’t even started”! But I was determined this time, I was determined to become the best versions of myself. Gene introduced me to Adam and from that day on, the fear of exercise has been history! Adam has taught me a lot about myself over the past 12 months, he has taught me that I actually am strong, I can push myself, the small victories should be celebrated and that through hard work you can achieve anything. Most importantly, Adam has helped me to realise my self-worth again, and it’s something I’ll always be grateful for. In the end, the 30+ kilos I have lost mean nothing if I can’t appreciate the hard work I have put into myself. Yes I still have bad days (even weeks) where I just want to give up, so I don’t give my sessions 100% or I don’t eat so well, but when you have someone who wants to see you succeed, it makes it easier to recover and pick yourself up again. Only I can make that decision to get up in the morning and make those changes and choices, but that is made a lot easier with someone cheering me on. Yes it’s hard, trust me I know, but with a good kick up the bum, the real want to change and just a small dose of determination, you will get through it….